Swarovski Crystals 2028 Flat Back Hot Fix. Available in sizes 12mm, 16mm or 20mm. Sold in 1 Gross packets (144 pieces). 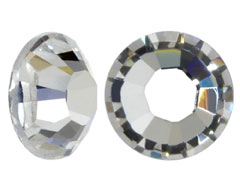 The back of these rhinestones have a pre-applied heat sensitive adhesive and are attached using heat. You must have a Hot Fix Applicator to apply these stones!